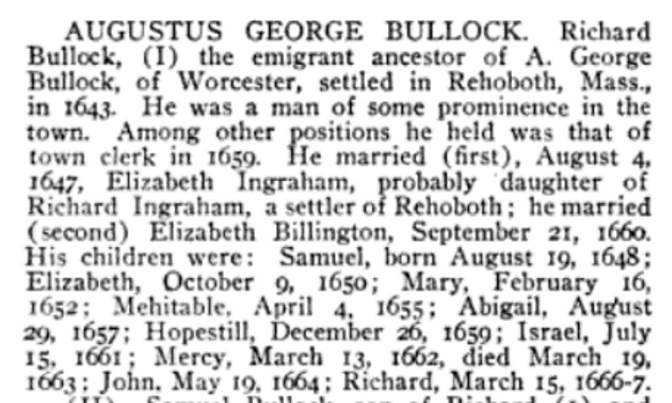 "Connecticut Births and Christenings, 1649-1906," database, FamilySearch (https://familysearch.org/ark:/61903/1:1:F77X-R4V : 3 December 2014), Hulda Bullock, 10 Aug 1767; citing ; FHL microfilm unknown. Ellery Bicknell Crane, a class="ext" href="http://books.google.com/books?id=ByzhgLUOIRIC" Historic Homes and Institutions and Genealogical and Personal Memoirs of Worcester County, Massachusetts, /aVol. 1, New York: The Lewis Publishing Company, (1907) , p. 19. John Morgan Peirce, A Bullock family history, , at https://books.google.com/books?id=uzw7AAAAMAAJ . Quincy, Calif.: (1976) , p. 14. John Morgan Peirce, A Bullock family history, , at https://books.google.com/books?id=uzw7AAAAMAAJ . Quincy, Calif.: (1976) , pp. 14-5. 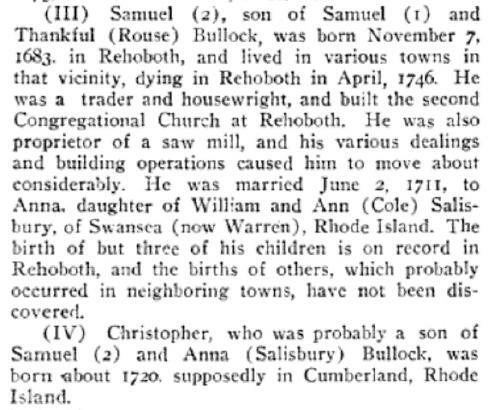 "Connecticut Births and Christenings, 1649-1906," database, FamilySearch (https://familysearch.org/ark:/61903/1:1:F7WB-FNL : 3 December 2014), Israel Bullock, 14 Sep 1769; citing ; FHL microfilm unknown. "Rhode Island Town Marriages Index, 1639-1916," database, FamilySearch (https://familysearch.org/ark:/61903/1:1:F8V3-WVM : accessed 18 December 2016), Lennox Bullock and Submit Burton, 29 Dec 1754; citing Bristol, Bristol, Rhode Island, United States, town halls, Rhode Island, and Rhode Island Historical Society, Providence; FHL microfilm 50. "Rhode Island Town Marriages Index, 1639-1916," database, FamilySearch (https://familysearch.org/ark:/61903/1:1:F8VQ-F87 : accessed 18 December 2016), Lennox Bullock and Elizabeth Fuller, 14 Feb 1768; citing Bristol, Bristol, Rhode Island, United States, town halls, Rhode Island, and Rhode Island Historical Society, Providence; FHL microfilm 24. "Rhode Island Deaths and Burials, 1802-1950," database, FamilySearch (https://familysearch.org/ark:/61903/1:1:F869-V5M : 6 December 2014), Child Bullock, 20 Jan 1774; citing Bristol, Bristol, Rhode Island, reference p 18; FHL microfilm 912,787. "Rhode Island Deaths and Burials, 1802-1950," database, FamilySearch (https://familysearch.org/ark:/61903/1:1:F869-V5W : 6 December 2014), Child Bullock, 12 Aug 1775; citing Bristol, Bristol, Rhode Island, reference p 18; FHL microfilm 912,787. "Rhode Island Deaths and Burials, 1802-1950," database, FamilySearch (https://familysearch.org/ark:/61903/1:1:F869-VP5 : 6 December 2014), Child Bullock, 03 Sep 1773; citing Bristol, Bristol, Rhode Island, reference p 18; FHL microfilm 912,787. 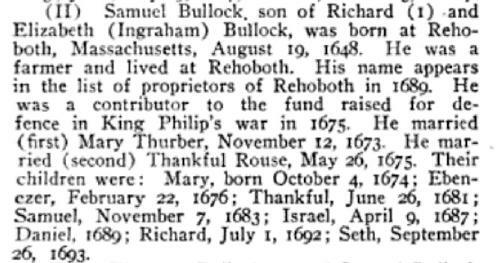 "Connecticut Births and Christenings, 1649-1906," database, FamilySearch (https://familysearch.org/ark:/61903/1:1:F77X-R62 : 3 December 2014), Rebeckah Bullock, 13 Oct 1761; citing ; FHL microfilm unknown. 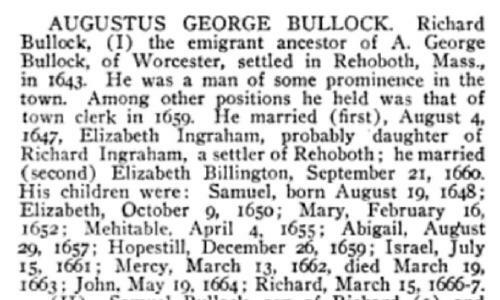 "Connecticut Births and Christenings, 1649-1906," database, FamilySearch (https://familysearch.org/ark:/61903/1:1:F77X-R4F : 3 December 2014), Hulda Bullock, 30 Oct 1763; citing ; FHL microfilm unknown. "Ashford Deaths", The Connecticut Nutmegger, Vol. 39, , at https://books.google.com/books?id=wDxVAAAAMAAJ . Connecticut Society of Genealogists, (2006) , p. 100. 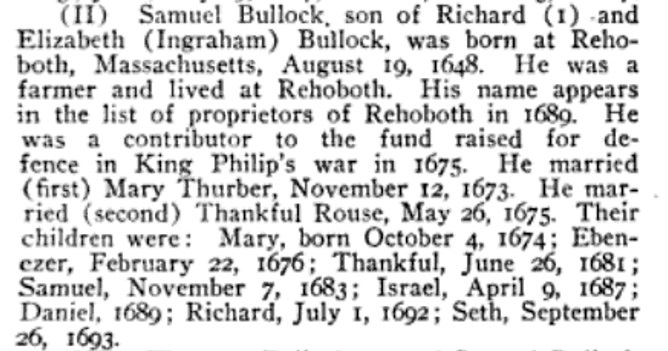 "Connecticut Births and Christenings, 1649-1906," database, FamilySearch (https://familysearch.org/ark:/61903/1:1:F7WB-F95 : 3 December 2014), Elijah Bullock, 16 Feb 1772; citing ; FHL microfilm unknown. Nathan Bullock was born perhaps about 1765. Richard Bullock was born perhaps about 1616. 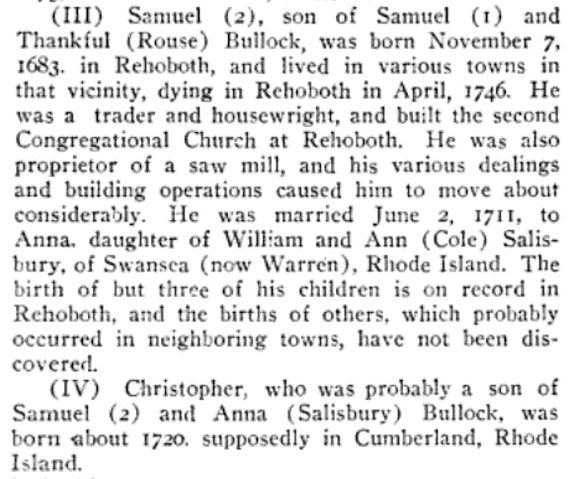 James N. Arnold, Vital record of Rehoboth, 1642-1896 : marriages, intentions, births, deaths, Providence, R. I.: Narraganset Historical Publishing Company, (1897) , p. 563. James Garland Bullock, Families of Bullock, Roebuck, Greensboro, N.C.: (1977) , p. 4. Ezra S. Stearns and William F. Witcher and Edward E. Parker, Genealogical and family history of the state of New Hampshire, New York and Chicago: Lewis Publishing Company, (1908) , Vol. 1, p. 407. History of Westmoreland (Great Meadow) New Hampshire: 1741-1970, and genealogical data, , at https://books.google.com/books?id=8GMjAQAAMAAJ . Westmoreland History Committee, (1976) , p. 359. 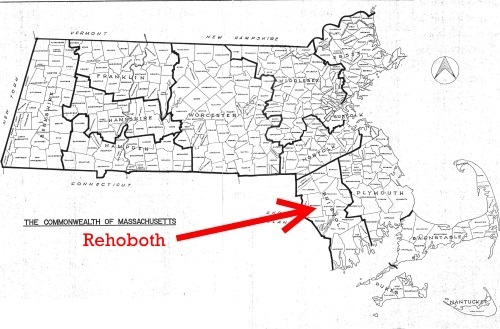 "Massachusetts Births and Christenings, 1639-1915," database, FamilySearch (https://familysearch.org/ark:/61903/1:1:FC7V-NYV : 4 December 2014), Squier Bullock, 04 Mar 1708; citing REHOBOTH,BRISTOL,MASSACHUSETTS, ; FHL microfilm 908,952.